First Listen: The Shouting Matches, 'Grownass Man' Bon Iver's Justin Vernon leads a loose, Tom Petty-esque blues-rock trio with an ear for beauty. But this isn't the stuff of mystery or misery; it's the work of a guy who loves playing music and saw an opportunity to have a blast on the side with friends he's joined on stage whenever possible. The Shouting Matches' debut album, Grownass Man, comes out April 9. Justin Vernon has to feel pressure every time he steps into a recording studio. As the leader of Bon Iver, he's gone 2 for 2, with a classic debut (For Emma, Forever Ago) followed by a lush and fussed-over album (Bon Iver) which won him a pair of Grammys, including one for Best New Artist. No matter his commercial ambitions, however reluctant he is to be viewed as a star, he's a star — and his career moves will be picked over accordingly. But Vernon also has capital to burn — not to mention favors he'd like to repay, friends whose careers he'd like to boost, and fun he'd like to have. So, a few years after recording a lovely album with his friends in Milwaukee's Collections of Colonies of Bees (under the name Volcano Choir), Vernon returns as part of an agreeably ramshackle, Tom Petty-esque blues-rock trio called The Shouting Matches. 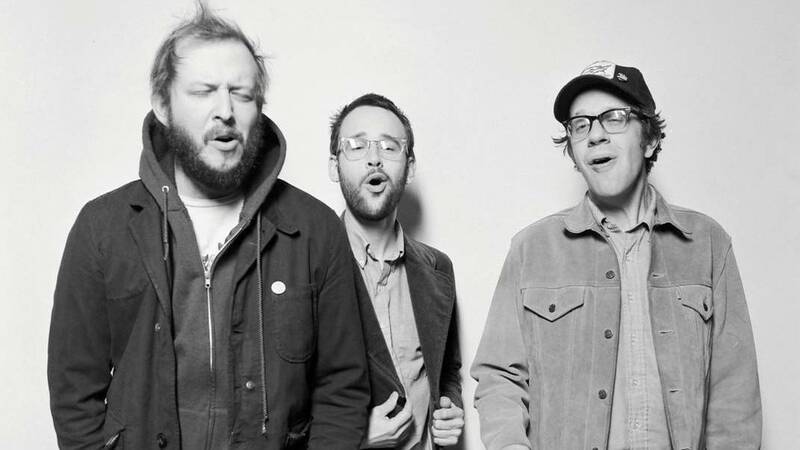 It doesn't even take 10 seconds for The Shouting Matches' debut album, Grownass Man, to present itself as something lighter in spirit than anything by Bon Iver; even before the opening riffs, a mere glance at the cover shows a smiling Justin Vernon, hanging out with his hometown pals. This isn't the stuff of mystery or misery, of yearning, of finding one's voice in a secluded cabin. It's the work of a guy who loves playing music — who's drawn influence from Talk Talk and Bruce Hornsby and many points in between — and saw an opportunity to have a blast on the side with friends he's joined on stage whenever possible. It's not that there are no stakes at work on Grownass Man — The Shouting Matches will play Coachella this summer, after all — but the trio benefits from a vibe of untethered looseness, even playfulness. Working with once and future bandmates Phil Cook and Brian Moen (the latter of Peter Wolf Crier), Vernon sheds his Bon Iver falsetto to showcase something closer to the deeper voice he employed in his DeYarmond Edison days. In "Heaven Knows," Vernon gets to work out his raggedy blues moan amid blustery rock that stomps and wails, but Grownass Man eventually works in a bit of the fragility on which its star made his name. "Seven Sisters" sounds for all the world like a lost Tom Petty classic — it's urgent, but with an undercurrent of gorgeousness — while "I'll Be True" locates the tissue connecting The Shouting Matches to its Grammy-winning big brother. It's Bon Iver's tenderness, after all, that gave Vernon the clout to will Grownass Man into being, so he never quite lets it leave his sight entirely.